Our straight stairlifts are built to last, with low maintenance and high reliability. They run on maintenance free DC power packs, which are automatically recharged at the end of every trip. This type of power ensures that the stairlifts are safe to use, and are incredibly smooth. Brooks Lincoln straight stairlifts come with all the necessary features and a few extra ones, as standard. 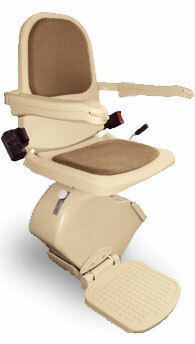 Thanks to all of the available features, the Brooks stairlift is safe, comfortable and easy to use. All Brooks straight stairlifts are guaranteed for a period of 12 months from the installation date. The guarantee covers you for all mechanical failures through defects in manufacture of the straight stairlift. Supplying stairlifts to the world.